Base 10 refers to the numbering system in common use. When you write “316”, the “3” means 300, the “1” means 10, and the “6” means 6. Method of writing numbers as the sum of powers of ten or as the sum of its units, tens, hundreds, etc. 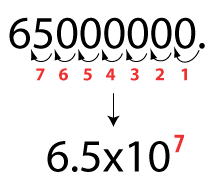 Scientific notation is a way of writing numbers too large or small to be conveniently written in standard decimal notation. The first number 6.5 is called the coefficient. It must be greater than or equal to 1 and less than 10. The second number (10) is called the base. The third number (7) is called the exponent or power of ten.